Y.O. Steakhouse claims its true Texas heritage from the internationally known Y.O. Ranch, located in the beautiful Hill Country of the Lone Star State. Land leaves its imprints upon the people who care for it, manage it and live on it, just as surely as these people leave their mark on the land. Nowhere can this be seen more clearly than deep in the tree-studded, canyon-broken heart of the Hill Country where the Y.O. Ranch has permanently branded six generations of the Schreiner family and those same hard-working folks have left their indelible prints on the Y.O. 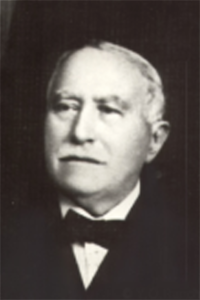 Captain Charles Schreiner immigrated from Alsace-Lorraine in 1852. The Y.O. brand was first used on the Texas gulf coast in the 1840’s by Youngs O. Coleman of the Fulton Family Ranching Empire near Rockport. The brand changed hands and made its way to hill country near Kerrville. In 1880, The “Captain” purchased the Y.O. Ranch, its brand, and its cattle from Taylor and Clements with profits he made by driving more than 300,000 head of Texas longhorns “up the trail” to Dodge City. The 40,000-acre Y.O. 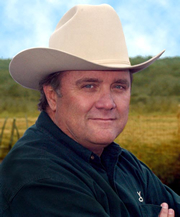 Ranch has remained in his family for six generations. Six generations of the Schreiner family have owned and operated the Y.O. Ranch – a tradition that continues today. In the early 1950’s, Charles Schreiner III pioneered exotic wildlife ranching at the Y.O Ranch, stocking the ranch with game animals from all over the world. 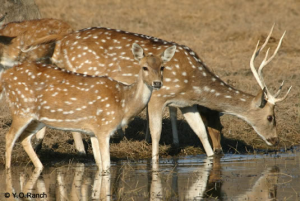 As early as 1953, Blackbuck Antelope, Axis Deer, Sika Deer, Fallow Deer and Auodad Sheep were introduced and have been running wild with the native Whitetail Deer since. Today, the Y.O. Ranch is home to 60 species of exotic wildlife including giraffe, zebra, rednecked ostrich, emus, onyx, rhea, and water buffalo. History and exotic wildlife tours are held daily presenting wonderful opportunities to view and photograph the animals in their beautiful Hill Country surroundings. From wildlife tours to horseback riding to trail drives, the Y.O. 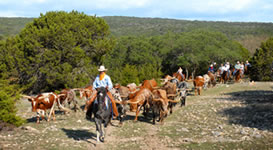 Ranch is the perfect location for day trips and family or corporate retreats.